I work a lot with delimited flat files, and a good way to display them in plain text is to create an ASCII table. The attached script, tab2tbl.pl uses the Text::ASCIITable module and can convert an incoming tab-delimited file to a nice looking table. If we are formatting UTF-8 data, not only are some of the characters encoded in more than one byte, they can also take up one or two spaces on the screen. The latter are referred to as double-width characters, and many CJKV glyphs fall into this category. See this proposal for a more detailed description. 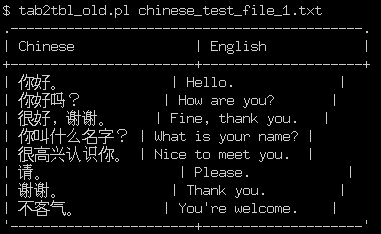 You can download the files mentioned above here: tab2tbl.pl, chinese_test_file_1.txt. I'm a Perl developer doing process automation, systems integration and ETL in support of a data warehouse. My GitHub repo is at https://github.com/mgualdron.